Roundtrip of Britain and Ireland is an exciting game that takes the players on a trip around Britain and Ireland through questions about history, geography, culture, grammar, vocabulary and idioms. The game board is set around an outline of the countries of Britain and Ireland and takes the form of a photographic journey from city to city, showing geographical features, monuments, major holidays and traditions. 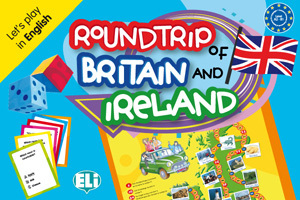 Roundtrip of Britain and Ireland is a great game to teach children all about Britain and Ireland, while improving their English language skills. This game is aimed at children learning English as a second language and is suitable for intermediates who are able to respond to simple questions in English. It would also be ideal for native English speakers to improve their language skills and knowledge of Britain and Ireland.